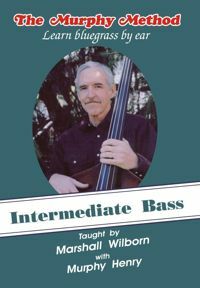 Intermediate Bass: Now that you’ve got the hang of the boom, boom, boom what comes next? Bass runs! (Bass runs are notes that “walk” from one chord to another. Hence the term “walking bass.”) We demonstrate each run and show you how to put it in a song. We introduce waltz time (“Amazing Grace”) and show you how to use the runs there, too. We venture into the key of B and as a special treat, Marshall shows you how to play the "boogie woogie" on the bass. We also include a special section on simple theory. “Ready, Marshall?” Ready, Murphy!” No Tab.